For the last 15 months the Trust’s PALS and Complaints team have been working in partnership with the Broadfield Tesco store in Aylesbury to support patient centred initiatives such as patient activity days and the PALS Exchange. The team, led by Claire Price, Complaints and PALS manager, and Helen Waddon, Community Champion for Broadfield’s Tesco have worked together to host a variety of events for patients in the adult and older adult mental health wards in Aylesbury. These have included an Olympic themed sports day, a pampering event and a ‘beside the sea’ themed party. Helen has kindly worked with her colleagues to arrange for donations of equipment and volunteered time to support these events. Patients who have been involved in these activities have been really positive about them and have said that it has helped them to have new and exciting things to look forward to on the wards. The Complaints and PALS team have been out and about raising awareness of these initiatives with stands at the local Tesco store, talking to members of the public about the work of the Trust and fundraising to support Oxford Health Charitable Funds in order to provide more activities and equipment for patients. In Aylesbury, the partnership continues to flourish with the development of the Whiteleaf Centre, our new health facility opening in early 2014. Helen is working with the Trust to support the development of a sensory garden on the site. If you would like to be involved with the work of the Complaint and PALS service, come on board to help provide themed days or would like to make a donation then please contact the team on 0800 328 7971. You can also visit the team at Buckinghamshire County Show on 29 August. 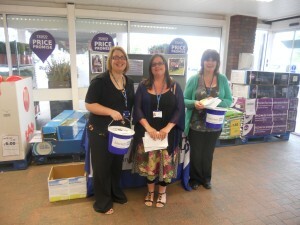 Sarah, Claire and Siobhan from the Trust raising awareness at the local Tesco store.